Roberto Brodsky was born in Santiago de Chile in 1957. 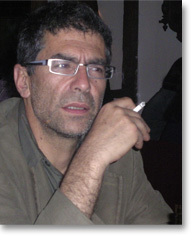 He is the author of novels such as El arte de callar, Ultimos dias de la historia and El peor de los heroes, and he was awarded the Jaén Prize for Best Novel 2007 for Bosque Quemado. His short stories have been published in a number of anthologies including El crimen de escribir and Con Pasión. He wrote the script for El brindis, a film directed by Shai Agosín; and was one of the three scriptwriters for Machuca, a film directed by Andrés Wood. He currently lives in Washington DC where he is a Visiting Scholar at Georgetown University.